On November 24, 2014, I showed you this peek of my baskets set on point. I kept adding baskets until I had a panel of 5 baskets. Then I sewed a solid strip down the center. Eventually, there will be one more solid strip and one more basket panel. The quilt will be called “Baskets of Honeysuckle, ” but it needs the honeysuckle in order to make it complete. I am at the point where I am itching to applique’. Before I go any further, you should know that I like to work in a pretty free-form style. I make templates out of plastic and cardboard, but determining where I want them to go has no specific pattern. I add things as I want to, move them around, etc..
Over the last week, I added some vines, and then made some templates for the leaves and flowers. 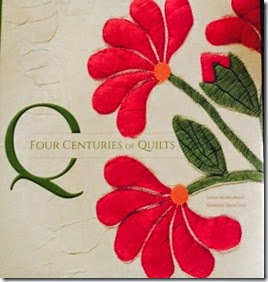 Some of the templates are based upon the beautiful quilt in this book. Others are free-form drawings by me. This is the stage that I LOVE! As I teach quilting classes, my students often will ask me if they can get a copy of the pattern for my quilts. The answer is usually “NO,” because I’m not a pattern kind of gal. The photo below shows you where I am right now. The vines that you see are basted down. More will be added to this panel. What you probably can’t see is the blue wash out marker lines where I have plans to add some applique’ leaves and flowers. Remember, this is a work in progress. It might look entirely different in two weeks. Things might be moved around, or things might be added. Who knows how it will turn out? I’m playing. That’s what happens when you play! What have YOU played with lately? 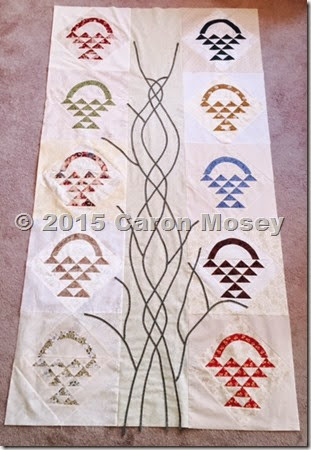 « Caron’s Feathered Star – Completed! My kids tease me about adding vines to everything. They call me the Vine Lady. However, I love what vines can add to the overall charm of many quilts, so…I often put them in. If they are not part of the top, they might become part of the quilting motif.